Buy Natures Aid Calcium, Magnesium & Zinc - 90 tablets in the UK from our online shop or directly from our independent Scottish store. As official Natures Aid stockist, we sell genuine Minerals A - Z directly from our shop in Scotland and online throughout the UK. Where can you buy real Calcium, Magnesium & Zinc 90's safely online? If you are wondering where you can buy Natures Aid Calcium, Magnesium & Zinc - 90 tablets safely online in the UK, then shop with us. We are an actual health foods shop; with real people selling real foods and products. Our award-winning independent shop is located in Stirling, Scotland since 1976. You can buy our Natures Aid nutritional supplements and other genuine Minerals A - Z in store or safely place an order with us online or over the phone. 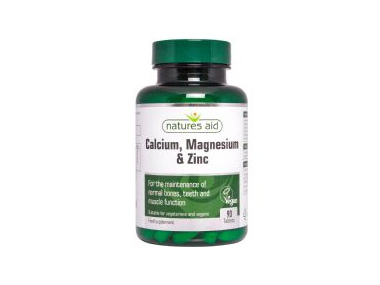 Calcium, Magnesium & Zinc 90's - Natures Aid Calcium, Magnesium & Zinc - 90 tablets in Minerals A - Z and Vitamins and Minerals.